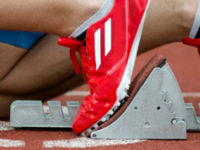 Starting blocks are designed to give sprinters an explosive horizontal burst. If you watched the Rio Olympics, you saw how quickly nine-time Olympic gold medalist, Usain Bolt, got the edge on other runners right from the start. The same is true when you present – if you want to gain the edge when you present, you must engage your audience right out of the starting blocks! Just because you speak does not mean you are heard! You are competing with audience filters, such as emotions, beliefs, perspectives, criteria, culture and more. There are times when you must acknowledge these filters right up front, or your audience will shut down their hearing. To make this simple, let us say your audience has a belief that the color orange is great, but you want to convince them the color purple is the way of the future. You must first acknowledge the positive intention of their belief about the color orange, or the odds are they will resist hearing anything about the benefits of purple. Our presentation coaches are Certified Master Practitioners in Neuro Linguistic Programming (NLP), the study of behavior and language patterns, and it is said in NLP, “When you accept the other person’s reality, everything becomes easier.” When you acknowledge audience filters, your ability to influence becomes much easier! 2) Don’t Throw Away Those Titles! There is a strange phenomenon across some of the Fortune 500 groups we work with to improve their presentations and speaking abilities. They still throw away their presentation titles! They are almost an afterthought – or so boring that they bring you to tears. It is not unusual to see a title such as, “Quarterly Management Update”. One of my favorite TED talks came from brain researcher, Dr. Jill Bolte Taylor. She had a massive stroke at age 37 and watched as her brain functions such as motions, speech and self-awareness shut down one by one. If a corporation had employed her, she might have titled her presentation, “Stroke Research Findings.” But, thankfully, she used her brain and named it, “My Stroke of Insight”. That is a clever title that immediately engages the audience and makes them do a double take! those who want to be more influential! Influential people know that stories simply have more stickiness and a higher engagement rate than other communication tools. Today, some content experts believe storytelling will be the biggest business skill of the next five years. As we like to say, storytelling is not for everyone – it is only for those who want to be more influential! A well-told story allows you to engage people at an emotional level, and studies show emotions trump facts and data when people make decisions. Long after an audience forgets many of the facts you presented, they will remember a good story that supports your facts and hooks them at an emotional level. Many leaders we coach want to stay in the “safe zone” and only tell personal stories. Those are great, but if you want to be even more engaging – collect third-party stories to deliver great teaching moments. According to Psychology Today, people process small clues about you when you speak — everything from tone of voice, to posture, and then they form a larger picture about you in their minds. And, a UCLA study reveals that nonverbal communication accounts for almost 90 percent of how people respond to your messages. As soon as you step up to present, the audience makes decisions about your credibility and likability. We find that many of the high potentials we coach do not have a nonverbal game plan when they present. The key to a solid nonverbal game plan is to start by identifying any limiting beliefs you have about yourself, your audience or the presentation. Beliefs drive your nonverbal cues! If your internal critic is beating you up with limiting beliefs, you will be sending out more signals than an air traffic control radar system. You will have more asymmetrical movements, voice patterns that mismatch your content and other distracting cues that dilute your effectiveness. You can try to fake the nonverbal cues, but it is much easier (and less stressful) to just clean up your beliefs, so you can comfortably use nonverbal cues that enhance your content and credibility. You can learn to be the Usain Bolt of presenters – by coming out of those starting blocks with something interesting and compelling. There are dozens of other strategies you can use to engage your audience when you open your presentations! Put yourself in the audience’s shoes and ask yourself what would pique your interest.